Scott Frost's loyalty to his old team could be valuable in building trust with his new team. Fans of the Nebraska Cornhuskers have plenty of reasons to be excited about the Scott Frost era in Lincoln. Among the hottest names in the coaching carousel this season, Frost is coming home to Nebraska with the hopes of turning things around after an undefeated season and a conference championship run with UCF. Similarly to how Penn State running back Saquon Barkley is going against the grain this bowl season by playing in his team’s postseason game when an NFL future is on the horizon, Frost is doing something somewhat unordinary for a head football coach. Rather than leave UCF to focus all of his energy on the Nebraska job, Frost is pulling double-duty and sticking with UCF through the bowl season. Frost’s dedication to his players at UCF has already paid off with his new job in Lincoln, as well. Frost has been clear in saying how much the players at UCF have meant to him as he prepares to leave for Nebraska. 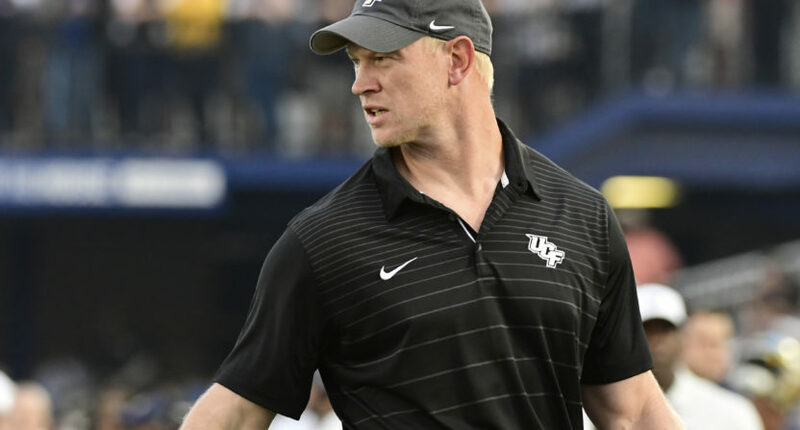 As easy a call as it may have been to accept a job offer from the Cornhuskers, Frost still has his heart set on the program he turned around at UCF. The emotions were visible as UCF captured the American Athletic Conference championship as news was breaking he was on his way to Nebraska. The skeptic would suggest it was all for show, but there was something a bit more genuine about how Frost was handling the situation as it unfolded. It seemed like an authentic display of a special a bond between a coach and players. Because of that bond, Frost has remained committed to flying back and forth between Lincoln and Orlando to handle all of the duties needed to get started with his work at Nebraska while preparing UCF for its bowl game. It makes for some tiresome days, but Frost’s dedication to his former program has become as valuable a recruiting tool as anything else for his new job at Nebraska. On Wednesday, Nebraska picked up a commitment from quarterback Adrian Martinez, a four-star quarterback prospect from California in the Class of 2018, according to 247 Sports. Let's recap: Scott Frost left Orlando just after 2:30 p.m. yesterday to fly across the country so he could visit a major prospect and returned to Florida at 5:30 a.m. this morning to continue bowl prep. Sure, Frost may genuinely want to finish the job he started at UCF with a chance to go 13-0 in the Peach Bowl against Auburn, but the message he’s sending to his future players at Nebraska is even more valuable. As Martinez sees, and others surely will as well, Frost is not going to quit on his players. Jimbo Fisher left Florida State with one regular season game left to play and is skipping out on the Seminoles’ bowl game. Willie Taggart is already in Tallahassee doing work as the new Florida State head coach while Oregon will play its bowl game this weekend with Mario Cristobal already in place as his successor. Coaches leading their old program in a bowl game simply is no longer the norm when they decide to leave on their own. This is what makes Frost a special case. Frost’s decision to coach UCF in the Peach Bowl offered some mild reasons for concern about his start at Nebraska. This year the NCAA is opening up an early signing period, giving coaches more reasons to focus on recruiting in the month of December. Frost deciding to split his focus between UCF and Nebraska could have cost Nebraska in the early recruiting calendar with the new signing period. But having Martinez on board shows the decision to coach in the Peach Bowl may be having more of a positive impact than a negative.